On a sleepy stretch of Nicholson St, in Carlton North, you’ll find one of our favourite openings of 2017. It’s not a high-concept fusion bar or some three-level marble brunch factory. 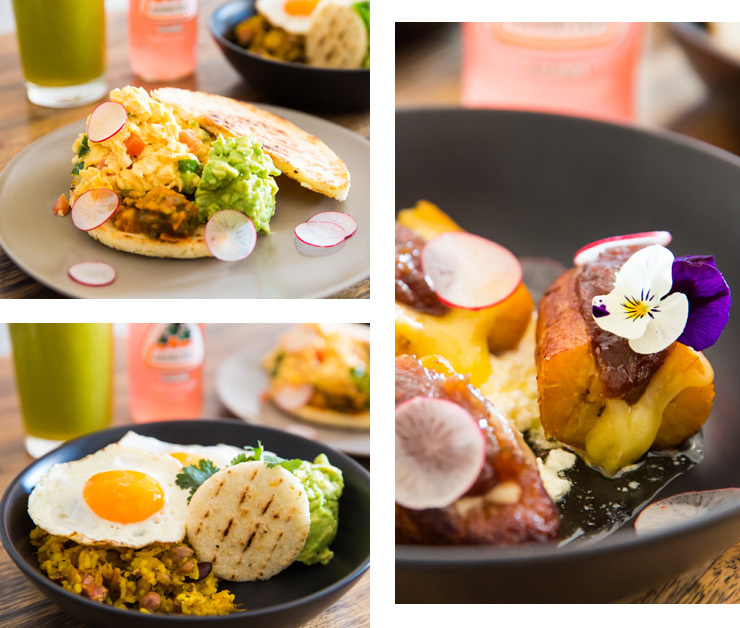 It’s a small community cafe, run by a friendly husband and wife team, and it’s doing some of the best South American breakfast food you’re ever gonna eat. ‘Good morning’ is a pretty appropriate translation for this place, because that’s what you’re gonna get when you plonk yourself down in the sunny back courtyard, Huila blend latte in one hand and sugar-dusted alfajore in the other. Buenos Dias makes their own dulce de leche from scratch—a salty-sweet caramel that they pipe between two crisp shortbread biscuits before dipping the whole thing in melted Colombian chocolate. That’s an alfajore. Make sure you order two for the road. You get good vibes from this place right from the get-go. The first thing you see is co-owner Nicolas’ massive smile beaming at you like a megawatt bulb. The second thing is the massive mural on the left-hand wall (an original work by street artist Crisp). There’s a native Kamentsá tribesman, a parrot from the Amazon, a Peruvian hummingbird and a yellow-beaked toucan, all inky-black detail and wall-popping colours. Nicolas and his partner Audrey have full-time jobs (he’s in pharmaceuticals, she’s in publishing). Buenos Dias is what they call a ‘passion project’, and the passion shows. The couple designed the interiors themselves. They built the function space table out back with their own two hands. They even imported their favourite South American soft drinks to give the place an authentic feel (if you haven’t tried a Jarritos soda or Brazilian Guaraná, you’re in for an effervescent treat). Running the pass is head chef (and co-owner) Andres Bejarano Valencia, and boy, can this guy cook...People tend to paint South American food in big, primary colours: rice, beans, meat and corn. But Valencia is proof that there’s subtlety (and a lot of flavour) if you dig a little deeper. Take the homemade chorizo sausages: big, gnarly hunks of well-seasoned pork, served alongside salt dusted potatoes and a house Chimichurri that smacks you between the eyes. Or the Royal Inca Eggs: slow-cooked, sous vide eggs on sourdough, drizzled in spice-pickled Tari-Tari sauce, made from Peruvian Aji Amarillo peppers. We promise, you’ve never tasted anything like it. But the undisputed hero of the menu (and the dish you’ll see flying off the pass like Quarter Pounders during rush hour) is the Calentao Rolo. This thing is officially the best breakfast bowl going around, and one of the frontrunners for our dish of the year. Wild Spanish rice mixed with house-made chorizo, pulled pork and beans, topped with fried eggs, crispy arepa and lemony smashed av’. It’s not overstating things to say this meal will improve your life by at least 12%. We would write an article on the Calentao Rolo along, but we’re worried it’ll start to sound like a creepy fetish. To drink? Take your pick. A sultry Colombian latte (Nicolas used a Huila blend from South America that’ll keep you buzzing all morning) or imported Mexican soft drinks. The kitchen also dishes up some kickass smoothies. Try either the Jugo de Mora en Leche (sort of a blackberry smoothie) or the Lulu Juice (a citrus-like fruit from Colombia that tastes somewhere between a rhubarb and a lime). Nicolas imports a lot of the fruit from South America—you just can’t get this stuff anywhere else in Melbourne. Melbourne’s full of flashy new openings, promising high-concept fusion art and spaghetti-lobster-javelins and god knows what else. It’s kind of nice to see a local cafe just doing what it loves, doing it simply, and doing it well. That’s a good morning in our books. Every day of the week. 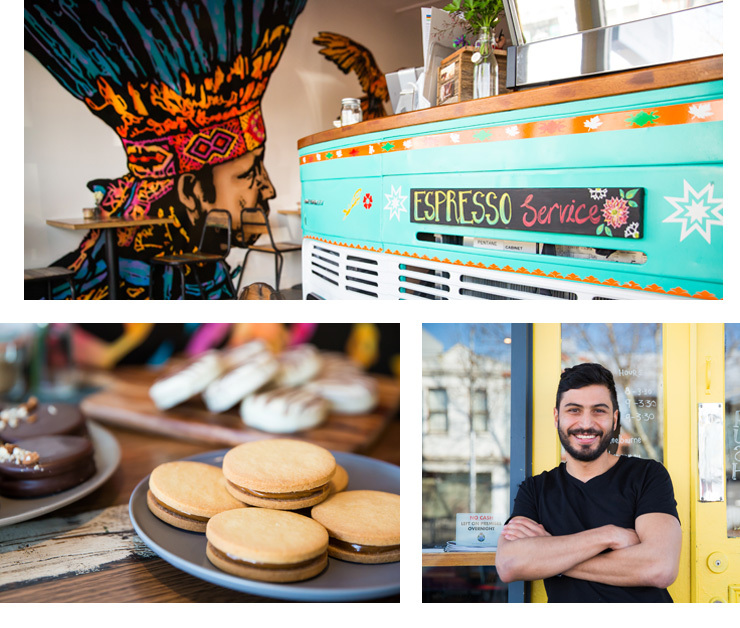 Want to learn more about Buenos Dias? Right this way, por favor.